Every once in a while, a boat comes along that’s so unique, there’s little else to compare it to. 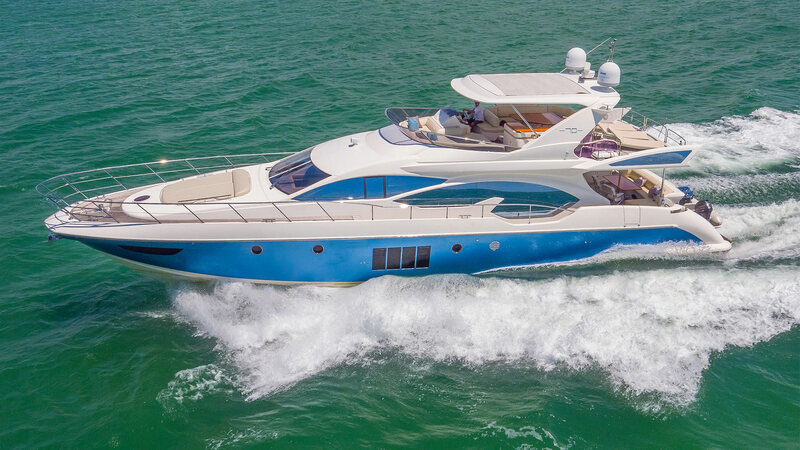 The 70′ (21.6m) Azimut SEVEN is such a machine. Graceful and elegant are just a few words that come to mind when talking about SEVEN. When you step onboard you get the feeling you are on a much larger yacht because of the great use of space. Attention to detail is demonstrated throughout the entire boat. Her main salon’s large windows provide expansive ocean views. The main deck galley is positioned perfectly to service the entire yacht. All 4 guest staterooms are spacious and feature ensuite bathrooms. Her crew quarters are aft of the engine room and have a separate entrance. You will be impressed with the comfort of her guest suites, the elegance of the main deck, and the largest flybridge in it’s category.